I attended the Thought Bubble Festival in Leeds this past November to promote my first book in my Soulstone Prophecy series. To help draw attention and pass the time at the booth, I created a dice game based on the Soulstone Prophecy story. We play tested the game and tuned the rules during the two days of the festival. We received a lot of good feedback on the game and even had a couple inquiries about purchasing it. I had promised at the time that I would post the rules up online. Well, here they are, along with a photo of our prototype. Give it a try and let me know what you think. Enjoy! A thousand years ago, a war among the gods nearly tore the world of Allwyn asunder. Haurtu, god of learning and wisdom, turned on his fellow gods and tried to consume them. It was only by combining their powers that the gods were able to defeat and imprison Haurtu. But a prophecy was discovered in sacred dwarven texts. Haurtu would return and finish what he began. It was written in the Book of Hjurl, “through his creations, his links to Allwyn, the Hungerer shall return.” Of all his creations, it was the humans who were most numerous. It was humans who were most prized by Haurtu. The God Wars were over and the Great Purge began. Now humans are almost extinct. Dwarven overseers test their human charges each year, looking for signs of the Hungerer’s return. Those humans who fail the Rite of Attrition are culled from the population for the good of all. Soulstones provide a link between humans and their banished god. The Soulstones bring great power, but also great danger. The Dwarves are dedicated to preventing the return of Haurtu. A human wielding the power of enough soulstones could fulfill the Soulstone Prophecy and release Haurtu. The Time of the Stonechosen as come! Start with nine Soulstones and a figurine representing the dwarven Culler in the center of the board. Take turns rolling a single die – the highest roll determines which player goes first. Re-roll any ties. This is the player who will go first for both phases of the game. Play then proceeds clockwise from the first player. On their turn, each player rolls three dice looking for doubles or a total of nine on all three dice. When a player rolls doubles, they may take one soulstone from the center. If the Culler is in the center, they place the Culler in front of them. Soulstones: For each soulstone a player has, they may re-roll a single die to try and get a double or try and roll a total of nine on their three dice. 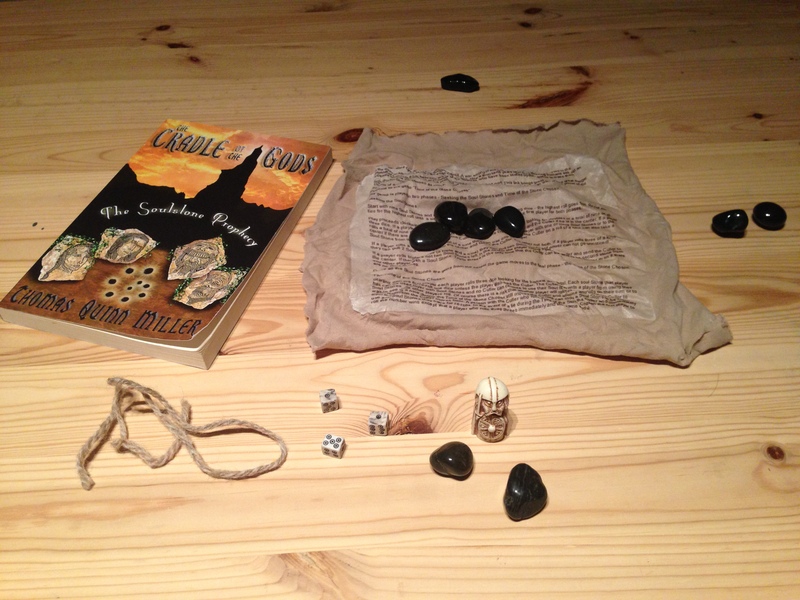 The Culler: If a player has the Culler, they may not use their soulstones to re-roll dice. If a player rolls a total of nine on their three dice they may choose to move the Culler to any other player who also has at least one soulstone or back to the center if there are no other players with a soulstone. The player moving the Culler on a roll of a nine also takes a soulstone from the player who had the Culler. This is the Dwarves’ tithe! If the Culler is in the center, they may take a soulstone from the center and not draw the attention of the Culler. If a player rolls a double and a total of a nine they may choose to treat the roll as a double or as a roll of nine, but not both. If a player rolls three of a kind they pull two soulstones from the center, if available. But, such a display of power can not go unnoticed! They also take the Culler no matter where it is in play. If there aren’t enough soulstones, the player only pulls the single soulstone from the center and does not draw the attention of the Culler. If a player rolls triple threes (a triple and a total of nine) they pull two soulstones from the center, if available, and moves the Culler to any other player with at least one soulstone or to the center. If there aren’t enough soulstones in the center the player may take the second stone from any other player. Once all the soulstones are gone from the center the game moves to the final phase – Time of the Stonechosen. If any player does not have at least one soulstone, they do not proceed to the next phase, but instead are out of the game. Starting with the first player determined by the initial roll, each player rolls three dice looking for the highest dice total. Each soulstone that player has can be used to re-roll one die unless the player also has the Culler. The Culler prevents a player from using their soulstones. A player with soulstones and no Culler can choose to use their soulstones for re-rolls on their turn or wait to see what other players roll. Of course there is a risk that another player will roll a nine and send the Culler to them. Rolling a nine during the Time of the Stonechosen still moves the Culler and allows a soulstone to be taken from the person the Culler moves from. A person with the Culler who rolls a nine can move the Culler and immediately use any soulstones they have for re-rolls. In the event of a tie during the Time of the Stonechosen the first player to roll the number wins and the game ends! You know, it’s funny. You tell yourself, “I’m going to write a book.” You never tell yourself, “I’m going to write a book and then spend all my free time learning how to market it.” There is a lot of advice out there on selling your book. I’m attending the first London Author Fair next week and was lucky enough to land one of the coveted PitchUp slots. I’ll get fifteen minutes to pitch my book to a literary agent. No pressure. So on come the pages (and pages) of advice on how to write a killer cover letter, the perfect pitch, and the succinct, yet oh so deep, summary page. All the while, all I want to write is the next chapter in book two, Time of the Stonechosen. First world problems, huh? Well, I thought I would share my 300 word pitch for Cradle of the Gods. Let me know what you think. “A thousand years ago, a war among the gods nearly tore the world of Allwyn asunder. Haurtu, god of learning and wisdom, turned on his fellow gods and tried to consume them. It was only by combining their powers that the gods were able to defeat and imprison Haurtu. But a prophecy was discovered in sacred dwarven texts. Haurtu would return and finish what he began. It was written in the Book of Hjurl, “through his creations, his links to Allwyn, the Hungerer would return.” Of all his creations, it was the humans who were most numerous. It was humans who were most prized by Haurtu. The God Wars were over and the Great Purge began. In time, truths became history, history became myths. Those humans who survive until today know little of the God War and the time of the Great Purge. Their simple life and subjugation at the hands of the dwarves is accepted by most as their lot in life, a necessary evil to protect them from themselves. In a small hamlet in one of the outlying human settlements, on the edges of a great dwarven empire, Ghile, an awkward young sheepherder, prepares to take his manhood test and his first Rite of Attrition. When to “Use the Force” and when to “Let it Go”. Alejandre Abaygar on Big Thank You! saharafoley on Big Thank You!